Angel Abbud-Madrid was born in Mexico in April 1961, the same month and year when Yuri Gagarin became the first human to venture into space. Eight years later, Abbud-Madrid’s parents woke him up to watch the first manned spacecraft land on the Moon. It’s no surprise then that from a very young age, he developed a fascination with space exploration. After graduating with degrees in mechanical and electrical engineering from the Instituto Tecnológico y de Estudios Superiores de Monterrey (ITESM), Abbud-Madrid worked for a couple of years as a project engineer at a silver and gold mine in the Sierra mountains of northern Mexico. But he was still captivated with the cosmos. To continue his education and get involved in space-related projects, he moved to the U.S. in 1986, where he received his master’s degree in aerospace engineering from Princeton University and his PhD from University of Colorado Boulder. “From the very start of my graduate education, I was fortunate to work in truly exciting projects studying physical phenomena under low-gravity conditions in NASA’s experimental facilities such as drop towers, parabolic flight airplanes and the space shuttle,” Abbud-Madrid says. In 1997, he participated as a member of the science operations team of combustion experiments flown on the STS-83 and STS-94 space shuttle missions. A year later, Abbud-Madrid jumped at the opportunity to participate on Mines’ first space experiment onboard the Space Shuttle. “That was the reason I came here,” he says. “For five years, I was a co-investigator of the water-mist fire suppression experiment, which flew on the STS-107 mission of the space shuttle Columbia in 2003. The success of this experiment earned Abbud-Madrid the NASA Astronaut’s Personal Achievement Award, given for outstanding contributions to human spaceflight safety and mission success, as well as the NASA Group Achievement Award for his contribution as a scientist on the STS-107 mission. The results of this experiment eventually led him to work with NASA and private companies to design, test and launch the water-mist portable fire extinguishers, which are now part of the International Space Station. Currently, he serves as the director of the Center for Space Resources at Mines. “We are working along with NASA, the commercial space sector and other universities in efforts to identify, excavate, extract, process and utilize resources from the Moon, Mars and asteroids, as well as to develop power, control and safety systems for human and robotic space missions,” he says. When invited to present at TEDxMileHigh at their Make + Believe Event in June 2016, he saw the lecture as an opportunity to reach a broader audience and share some ideas related to his research at Mines. At Mines, Abbud-Madrid also teaches a course every fall on space exploration, serves as the Director of the Space and Planetary Science and Engineering Area of Special Interest, the Affiliate Director of the Colorado Space Grant Consortium and the faculty advisor of the Mines American Institute of Aeronautics and Astronautics student branch, the Astronomy Club and the Rocket Club. He acts as Mines’ representative to the Universities Space Research Association, the Colorado Space Coalition and the Colorado Space Business Roundtable. Outside of Mines, Abbud-Madrid is immersed in books and maps of all subjects, flies airplanes in the Colorado skies, and spends entire nights observing constellations, planets and stars. He is also the president of the Rocky Mountain Map Society and the Space Resources Roundtable. Abbud-Madrid believes space exploration is humankind’s next big step on scientific discovery and technological development and wants to see every discipline in STEM as a part of the effort. 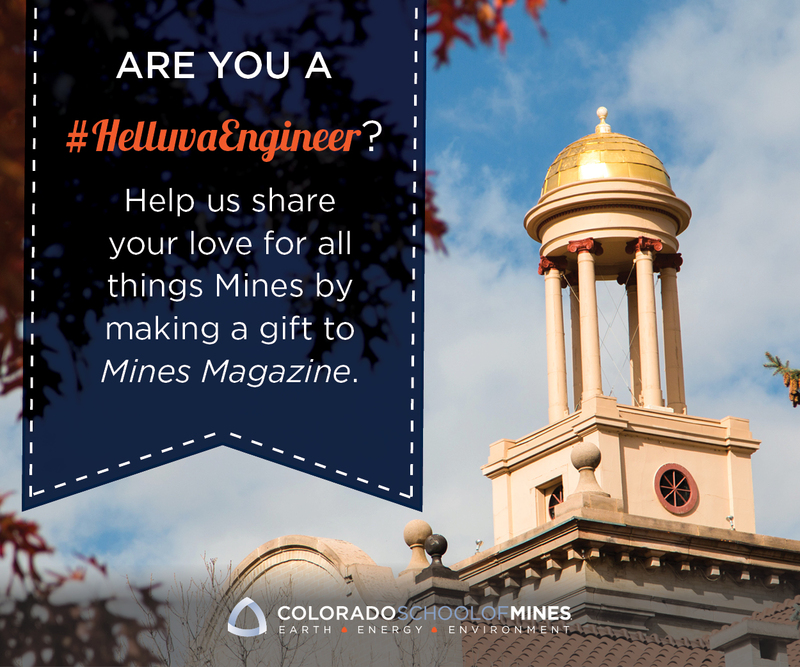 “Given the interest of Mines students from all departments to get involved in the most exciting and innovative areas of engineering of their generation, coupled with Colorado having the second largest aerospace economy in the nation, it is easy to see Mines positioning itself to take advantage of this confluence of opportunities, both academically and in research,” he says. Watch Abbud-Madrid’s presentation at TEDxMileHigh below.